Phones like the Gionee Elife S5.5 have come a long way. Well, they're coming from China but this is not stating the obvious as a figure of speech. We've seen good-looking phones made in China that are not the iPhone. We've seen reasonably-powered too. We've seen imitation evolve into real innovation. So, Gionee is trying to do what Huawei, Oppo and Xiaomi have been good at for a while. That's quite an example to follow but how do you stand out from this kind of crowd? Even relative newcomers Gionee know all they need is an eye-catcher. 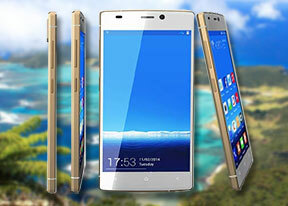 Touted as the slimmest smartphone in the world, the Gionee Elife S5.5 is seriously good-looking too. Two Gorilla Glass 3 layers either side of a magnesium alloy frame is a combo we'd opt for in a heartbeat. The gorgeous super slim shell packs a beautiful 5" 1080p Super AMOLED screen, with an octa-core chipset ticking inside. Gionee had a good look at Android Jelly Bean and went for a complete overhaul of the UI. It doesn't look bad at all, and it certainly behaves - but we've yet to give it a proper try. Just like Huawei and Oppo, Gionee aimed for simplicity, but tried to give users some extra features on top of core functionality. The lack of 4G is not a huge letdown yet - at least not on the target markets, of which India claims a sizeable chunk. We would guess that it's things like the non-expandable storage and the sealed battery that would be the deal breakers for some. The heavily customized Amigo OS is based on Jelly Bean and there's nothing certain at this point about an upgrade to KitKat. The more recent, better-optimized OS version would've been easier on the octa-core MediaTek chipset. That by the way, is the same chipset ticking inside the Alcatel Idol X+, which we found to be a reasonable performer. Before we move on and start exploring the Gionee Elife S5.5, a side note is due. A bit unusual perhaps, especially for a flagship, it's not just the Elife 5.5 we're reviewing. The exact same package is available as the Allview X2 Soul and the Blu Vivo IV. Well, Gionee must be keen on making the device widely available even if that makes them a white label manufacturer. Join us after the break, where the world's slimmest smartphone gets through our traditional routine of unboxing and hardware checkup.